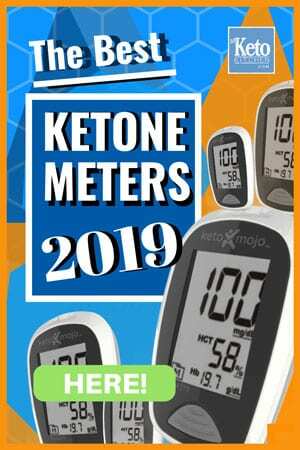 Keto Cheese & Bacon Rolls Recipe – Low-carb and gluten-free! These Keto friendly Low-Carb Cheese and Bacon Rolls are delicious and won’t throw you out of Ketosis! 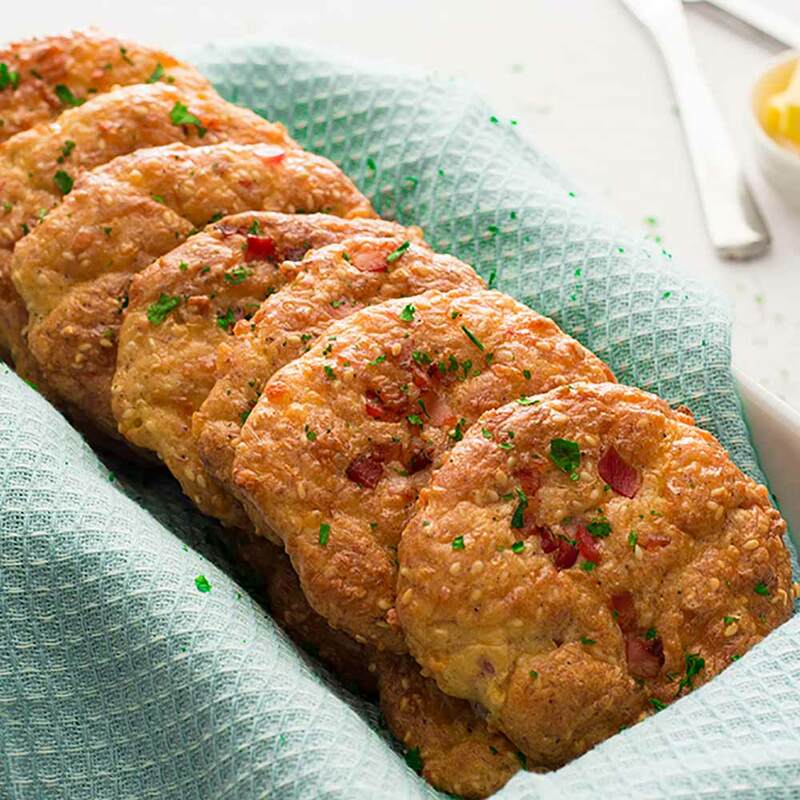 Straight from the oven, or warmed in the toaster, you’ll be baking these Keto Cheese & Bacon Bread Rolls over and over. If you want to be creative you could even bake mini bites by adding the mixture to a mini cupcake tray and serve them with butter. 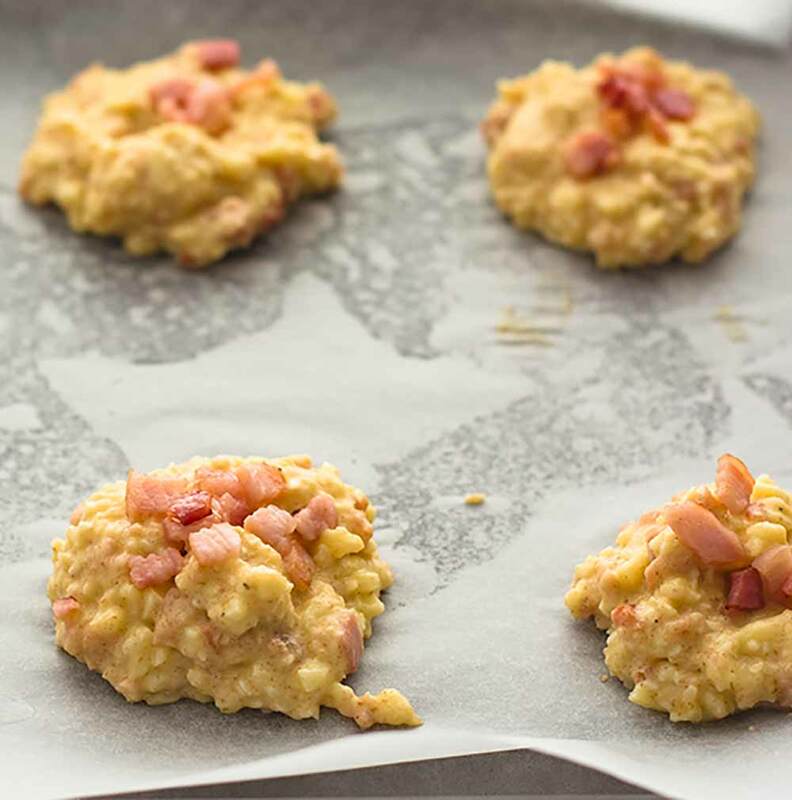 For more cheese and bacon keto snacks check out our Low Carb Bacon and Sour Cream Muffins or our Easy Low Carb Cheese Chips. The recipe makes 12 Keto Cheese and Bacon rolls, one serve is one roll. Saute diced bacon in a non stick frying pan over medium heat, until just starting to brown. Turn off the heat. Spoon the mixture into 12 even piles on lined baking trays. Sprinkle the reserved bacon on each roll. To make these Keto Cheese and Bacon Rolls in a larger batch adjust the serving size in the recipe card above. Do you drain the bacon grease ? No, keep all of that delicious bacon grease and mix it into the rolls. Mine spread out into one large blob! I drained the bacon and substituted flax meal for the psyllium husk. Do you think these could be made in muffin cups or muffin top tins? They certainly could be! The muffin top tins are a great idea to make nice thin bread for burgers and sandwiches. It’s just a little bit of chopped parsley to add a bit of colour to the photo. Why use psyllium? Is there an alternative? Psyllium is a great source of fiber, as resulting from the fiber is low in net carbs. It also soaks up liquid, turning a sticky “batter” into more of a dough. You could try using flaxseed meal, but we haven’t tested it. Let us know how you go if you decide to try it. I am not a fan of sesame seeds. Could I just omit it, or is there something to substitute? You could try removing them completely, and if the mixture is too wet to make little piles then add a tablespoon or 2 of almond flour. Hope that helps. These are delicious! We ate ours with a fried egg! Yum! That sounds great Amy. Do you use psyllium husk powder or flakes? The recipe used the psyllium husk (or flakes) and not the powder. So, if we have the powder not the flakes; can we still use the powder? I would recommend using half the powder to flakes and slowly adding more if needed. Hope that helps. Are the nutrient facts for ONE roll? Do you know how long to cook them if you use a mini cupcake pan? These were awesome. Mine spread out like cookies but are really bangin. I’m going ro keep making these. If I was to make this for a weekend brunch, what type of cocktail should I serve and do you have a wine recommendation? I’m sorry I can’t be of much help to you, I don’t drink! I hope you find something nice to have with them.